Walking down Broadway in Saranac Lake, you may get an overwhelming feeling that someone is watching you. As you approach the Eat ’n Meet Grill and Larder, he makes himself known: From the building’s balcony, the King surveys all who pass. At least, that’s what the life-sized plastic statue of Elvis appears to be doing. The objet d’art sets the mood for the Eat ’n Meet. There’s a free mini-golf course on the hilly property. Folks play a round in the shade of trees while they wait for jerk chicken or schnitzel prepared by Chef-owner John Vargo and his very own Sancho Panza, Mike Mironchik. Though it offers no eat-in dining, Eat ’n Meet is not your average snack bar. Vargo, 45, is a New England Culinary Institute grad who turned down Chef Robert Barral’s invitation to be executive chef at Burlington’s now-defunct NECI Commons restaurant. The farm-to-table ethos he learned in Vermont and the Hudson Valley reigns at the Eat ’n Meet. What Vargo can’t prepare just hours after it has been picked or plucked goes in his freezer to be sold to customers. If he has his way, Burlington may someday get a taste of his concept. Vargo opened the takeout restaurant four years ago this August — and he designed it without an eat-in option. Business is flourishing now, but building it was a challenge at first. Vargo had to train take-out customers to wait for food made from scratch — as nearly everything is at the Eat ’n Meet, from potently fruity raspberry vinegar to smoked brisket. “We have the best Reuben this side of New York City,” Vargo brags. Because of his attention to detail, meals can take half an hour or more from the time they’re ordered. Initially, he says, many locals in search of fast food were turned off. But now they’ve learned to check the ever-changing menu posted on Eat ’n Meet’s website each day and call ahead, then come and hang out with BYObeer by the links. “God knows what they do up there,” says Vargo, laughing. Since the early days, Vargo and his wife, Colleen, have added quirky tables and chairs to the tiny dining room, where diners can read books about the Adirondacks or check out other tag-sale decorations, such as a box of “Road Kill Helper.” The ladies’ room is home to several paintings of wide-eyed, traumatized-looking children. What Vargo didn’t need to train his clientele to do was enjoy his sometimes out-there dishes. Southern-fried frog legs are a popular staple. 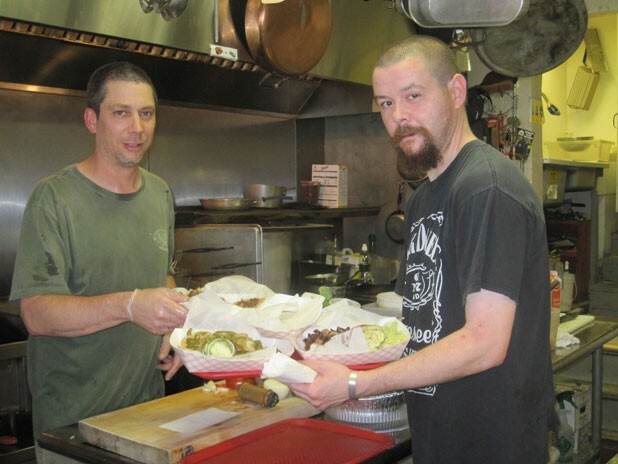 “People in the area are really open to frog legs and organ meats,” Vargo says. Many of those people are fellow chefs. With all the cooks at Lake Placid resorts and culinary students at nearby Paul Smith’s College, Vargo notes, his customers tend to have palates of above-average sophistication. “The head chef from Mirror Lake [Inn Resort and Spa in Lake Placid] is out on the deck right now,” he says. With clientele like that, Vargo can sell several different charcuterie items each day. In the paper or foil takeout containers that hold the food at the Eat ’n Meet, diners can pick up soppressata or chicken-liver mousse with toast points. Vargo uses his classical training to make confit from farm-fresh duck legs and gizzards in fat and herbs. Vargo was born in Tennessee but grew up in the Hudson Valley, where both his parents were employed at the Culinary Institute of America — his mother as an administrator, his father as the school’s first-ever instructor in refrigeration. In his early twenties, before he headed to NECI, Vargo learned some of his kitchen skills in a less likely place: the U.S. Army. One of his superiors, a chef named Al Jenkins, was a member of the army’s Culinary Arts Team, which enters Bocuse d’Or-style cooking competitions. With his guidance, Vargo ended up competing in the World Culinary Olympics in Frankfurt, surrounded by master chefs. When most American chefs say they’re French-trained, they mean they had a French instructor at culinary school. But Vargo didn’t just study at NECI with Barral (now of Brandon’s Café Provence); he interned at Le Grenadin in Paris. When you order the $14 lobster-mushroom Newburg at Eat ’n Meet, you can bet that, though it’s vegetarian, it tastes authentic. Vargo’s travels inform the dishes he makes today. He handcrafts flat kielbasa patties like the ones he had in Frankfurt, and is sure to serve his pork schnitzel on a real Brotchen bun. Another perennial specialty is Portuguese sardines dusted with masa flour and fried, then tossed with sherry vinegar and tomatoes. Unlike most beignets served in the U.S., Vargo’s are nothing like doughnut holes. They’re made from pâte à chou, the same pastry used for profiteroles, and emerge flaky and light, served with black raspberry compote. Even Vargo’s chocolate chip cookies are made to order and come meltingly hot from the oven, with a side of whipped cream and a sprig of mint. Vargo’s cuisine also offers Caribbean flavors: In the ’90s, after completing his studies and working with Smith, he spent time in the islands researching and selling his own brand of hot sauce. Now he offers hot sauces at Eat ’n Meet and online. The sweet and mustardy Jamaican Maroon variety is the perfect accompaniment to Vargo’s plantain dumplings. For just a dollar, diners get two fist-sized starch patties that taste like banana donuts made of mochi. Jamaican beef patties and fish tacos are also on the menu. However, Vargo’s ingredients are firmly grounded in the Adirondacks. His Blue Line burgers are made from Adirondack Beef Company animals. The mild feta he puts on top, along with crispy and fatty guanciale, is from Asgaard Farm and Dairy in Au Sable Forks. Last Wednesday’s special was a trio of wild-mushroom empanadas featuring locally foraged lobster mushrooms and chanterelles. The result was closer in taste to a French pastry than Latin American street food. Combined with herbed sour cream and a side of fresh greens and cucumber purée, the meal was decadent — and only $10. But he is willing to provide the raw materials via his new line of frozen products fresh from the farm, Heat ’n Eat. Right now, morels are piled in the restaurant’s freezer. Vargo also freezes some of the meat he buys wholesale from farmers, such as pork from Harmony Hills Farmstead in Malone. The rest he sells “as is,” or prepared as homemade Italian sausage or pulled pork. Eat ’n Meet Grill and Larder, 139 Broadway, Saranac Lake, N.Y., 518-891-3149.